Thomas Tag has long been probably the only authority on lamps, lens apparatus and illumination for lighthouses, with his articles on the subject appearing in our catalogue, as well as the U. S. Lighthouse Society’s Keeper’s Log, Lighthouse Digest and other publications. Now Tom has put together much of this information in seven publications which detail the entire subject, from lamps and fuels, to burners, lens apparatus, manufacturing processes and more. This is a superb collection that answers the questions that many of us have been asking for some time, and will serve as a reference on the subject for years to come. Each of the booklets includes a complete set of footnotes defining the sources of the data for those interested in further research. Thomas Tag has long been probably the only authority on lamps, lens apparatus and illumination for lighthouses, with his articles on the subject appearing in our catalogue, as well as the U. S. Lighthouse Society’s Keeper’s Log, Lighthouse Digest and other publications. Now Tom has added still another volume to his list of publications – The Clock Without Hands. This detailed account covers a long neglected area of lighthouse equipment – the mechanical weight-driven mechanisms that rotate the lenses causing the flash that we see. The author covers a history and design of these mechanisms, chariot wheel systems, mercury flotation systems, clockwork mechanisms, and much more. Thoroughly illustrated with early photographs and drawings, this booklet makes most interesting reading. 17p. (M). #28183 Sold Out. The View Near Graemsay Island . Thomas Tag has long been probably the only authority on lamps, lens apparatus and illumination for lighthouses, with his articles on the subject appearing in our catalogue, as well as the U. S. Lighthouse Society’s Keeper’s Log, Lighthouse Digest and other publications. Now Tom has added still another volume to his list of publications – The View Near Graemsay Island . This author recently acquired a hand written diary by none other than lighthouse engineer Alan Stevenson. One section, of particular interest, described landmarks off the island of Graemsay that Stevenson wrote about in 1850 and 1851. The author decided to visit these areas, and this is his detailed description of what he found. Illustrated with early photographs and drawings, this booklet makes most interesting reading. 18 p. (M). #27420. $26. Sale Price $18. Bell Rock 200th Anniversary – Part 1 - 1806. Thomas Tag has long been probably the only authority on lamps, lens apparatus and illumination for lighthouses, with his articles on the subject appearing in our catalogue, as well as the U. S. Lighthouse Society’s Keeper’s Log, Lighthouse Digest and other publications. Now Tom has added still another volume to his list of publications - Bell Rock 200th Anniversary – Part 1 – 1806. Two Hundred years ago, in 1806, the design, development plans and construction authorization for the Bell Rock Lighthouse in Scotland were approved. This story covers the developments during 1806 and the early history of the Bell Rock. Illustrated with early photographs and drawings, this booklet makes most interesting reading. 4 p. (M). #27419. $26 Sale Price $18. Brilliance and Prejudice – The John R. Wigham Story. Thomas Tag has long been probably the only authority on lamps, lens apparatus and illumination for lighthouses, with his articles on the subject appearing in our catalogue, as well as the U. S. Lighthouse Society’s Keeper’s Log, Lighthouse Digest and other publications. Now Tom has added still another volume to his list of publications – Brilliance and Prejudice – The John R. Wigham Story. 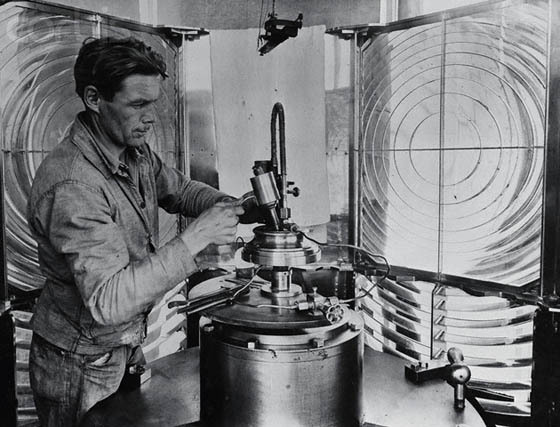 This is the story of a brilliant engineer who created some of the most interesting lighthouse equipment ever developed. His designs would be both praised and maligned and would lead to conflict, prejudice, plagiarism, and the ultimate resignation of one of the leading scientists of the day. Thoroughly illustrated with early photographs and drawings, this booklet makes most interesting reading. 33 p. (M). #2750. $26. Sale Price $18. The Fresnel Lens Makers Part VI The Other Glass and Lens Makers. Thomas Tag has long been probably the only authority on lamps, lens apparatus and illumination for lighthouses, with his articles on the subject appearing in our catalogue, as well as the U. S. Lighthouse Society’s Keeper’s Log, Lighthouse Digest and other publications. Now Tom has added still another volume to his list of publications – The Fresnel Lens Makers Part VI – The Other Glass and Lens Makers. This final part describes the remaining lens makers including AGA, Pharos Marine, Automatic Power, Corning , Macbeth-Evans, Gebr., Dr. Genthe Glass, Nitsche & Gunther, Julius Pintsch, and Wilhelm Weule. Thoroughly illustrated with early photographs and drawings, this booklet makes most interesting reading. 31 p. (M). #26333. $26. Sale Price $18. Church Steeples and Fog Signals. Thomas Tag has long been probably the only authority on lamps, lens apparatus and illumination for lighthouses, with his articles on the subject appearing in our catalogue, as well as the U. S. Lighthouse Society’s Keeper’s Log, Lighthouse Digest and other publications. Now Tom has added still another volume to his list of publications – Church Steeples and Fog Signals. 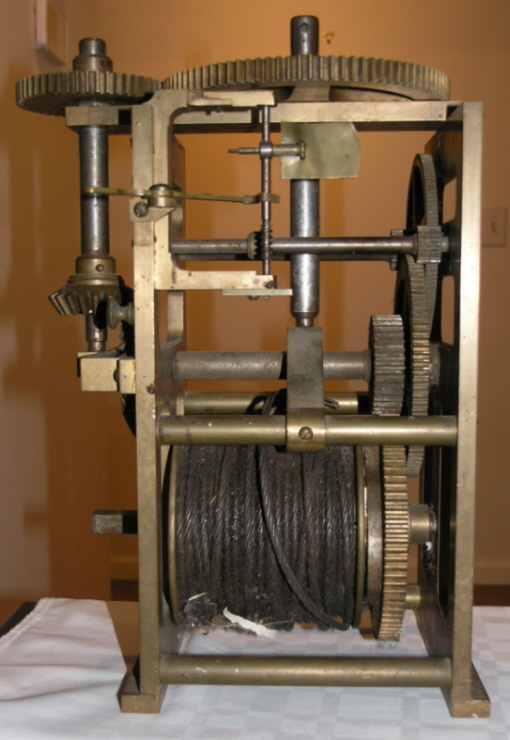 This detailed account covers a long neglected area of lighthouse equipment – the mechanical weight-driven fog bell strikers. The author covers a history of fog bells, bell construction, wave actuated bells and clockwork-striking machinery. Included are Lowell Fog Bell Strikers, Custer Strikers, Daboll Strikers, Stevens, Gamewell, and more. Thoroughly illustrated with early photographs and drawings, this booklet makes most interesting reading. (M). #26212 $26. Sale Price $18. The Fresnel Lens Makers Part V – The Barbier, Benard And Turenns (BBT) Lens Works. Thomas Tag has long been probably the only authority on lamps, lens apparatus and illumination for lighthouses, with his articles on the subject appearing in our catalogue, as well as the U. S. Lighthouse Society’s Keeper’s Log, Lighthouse Digest and other publications. Now Tom has added still another volume to his list of publications – The Fresnel Lens Makers Part V – The Barbier, Benard And Turenns (BBT) Lens Works. Part V of six parts, describes the development of the early Fresnel lenses and defines the companies and individuals who took part in this effort. Augustin Fresnel had assistance from many sources as he developed and perfected his lens. This part details the work of the Barbier, Benard And Turenns (BBT) in France . From its beginnings in the 1860’s the company was one of the leading makers of Fresnel lenses for the world market, and to its current status as today’s Samtec-Gisman Company, still producing navigation buoys. 11p. (M). #26122. $26. Sale Price $18. Shown is a Chance Bros. lamp and lens assembly. The Fresnel Lens Makers Part IV Chance Brothers Glass Works. Thomas Tag has long been probably the only authority on lamps, lens apparatus and illumination for lighthouses, with his articles on the subject appearing in our catalogue, as well as the U. S. Lighthouse Society’s Keeper’s Log, Lighthouse Digest and other publications. Now Tom has added still another volume to his list of publications – The Fresnel Lens Makers Part IV Chance Brothers Glass Works. Part IV of five parts, describes the development of the early Fresnel lenses and defines the companies and individuals who took part in this effort. Augustin Fresnel had assistance from many sources as he developed and perfected his lens. This part details the work of the Chance Brothers Company in England , from its beginning as a glass window maker to its production of Fresnel lenses for the world market, and to its final demise in 1977 after being divided into several companies. (M). #2659. $26. Sale Price $18. The Fresnel Lens Makers Part III The Henry-Lepaute Lens Works. Thomas Tag has long been probably the only authority on lamps, lens apparatus and illumination for lighthouses, with his articles on the subject appearing in our catalogue, as well as the U. S. Lighthouse Society’s Keeper’s Log, Lighthouse Digest and other publications. Now Tom has added still another volume to his list of publications – The Fresnel Lens Makers Part III The Henry-Lepaute Lens Works. Part III of five parts, describes the development of the early Fresnel lenses and defines the companies and individuals who took part in this effort. Augustin Fresnel had assistance from many sources as he developed and perfected his lens. This part details the work of the Henry-Lepaute Lens Works, in France , from its beginnings as a clock maker, to its production of Fresnel Lenses for the world market, to its current status. (M). #25335. $26. Out of Stock. The Fresnel Lens Makers Part II Sautter. Thomas Tag has long been probably the only authority on lamps, lens apparatus and illumination for lighthouses, with his articles on the subject appearing in our catalogue, as well as the U. S. Lighthouse Society’s Keeper’s Log, Lighthouse Digest and other publications. Now Tom has added still another volume to his list of publications – The Fresnel Lens Makers Part II Sautter. Part II of five parts, describes the development of the early Fresnel lenses and defines the companies and individuals who took part in this effort. Augustin Fresnel had assistance from many sources as he developed and perfected his lens. This part details the work of the Louis Sautter Company, in France from its beginnings producing Fresnel lenses and other lighthouse equipment from 1852 to the company’s final demise in 1970. 10 p. Spiral bound. (M). #25216. $26. Sale Price $18. The Fresnel Lens Makers Part I Early. Thomas Tag has long been probably the only authority on lamps, lens apparatus and illumination for lighthouses, with his articles on the subject appearing in our catalogue, as well as the U. S. Lighthouse Society’s Keeper’s Log, Lighthouse Digest and other publications. Now Tom has added still another volume to his list of publications – The Fresnel Lens Makers Part I Early. Part I of five parts, describes the development of the early Fresnel lenses and defines the companies and individuals who took part in this effort. Augustin Fresnel had assistance from many sources as he developed and perfected his lens. The players in this story have become blurred by time and confused due to their unusual interrelationships. This story will help to alleviate the confusion. 20 p. Spiral bound. (M). #25128. $26. Out of Stock. Who Invented The Fresnel Lens? Thomas Tag has long been probably the only authority on lamps, lens apparatus and illumination for lighthouses, with his articles on the subject appearing in our catalogue, as well as the U. S. Lighthouse Society’s Keeper’s Log, Lighthouse Digest and other publications. Now Tom has added still another volume to his list of publications – Who Invented the Fresnel Lens. From 1822, when Fresnel published his first paper Memoir sur un Nouveau System d’Eclairage des Phares, Sir David Brewster, in Scotland , claimed that he was the true inventor. This account discusses the various claims and should finally settle the dispute. 15 p. Spiral bound. (M). #24155. $26. Sale Price $18. 2003. 17p. Soft wraps. Thomas Tag has long been probably the only authority on lamps, lens apparatus and illumination for lighthouses, with his articles on the subject appearing in our catalogue, as well as the U. S. Lighthouse Society’s Keeper’s Log, Lighthouse Digest and other publications. Now Tom has added still another volume to his list of publications – The Drummond Lime Light. The Durmmond Lime Light is produced by two jets of gas, one of oxygen and the other of hydrogen, ignited upon a ball of lime. The author discusses the light as it was tested for use in lighthouses in the early 1800’s. Beginning with the actual story of the Lime Light development and trials, the author then continues with seventeen pages of detailed background information about the light and the lighthouse trials. Includes photographs and diagrams, this volume is the definitive source on the subject. (M). #23325. $26. Sale Price $18. From Braziers And Bougies To Xenon. 2003. 41p. Soft wraps. Thomas Tag has long been probably the only authority on lamps, lens apparatus and illumination for lighthouses, with his articles on the subject appearing in our catalogue, as well as the U. S. Lighthouse Society’s Keeper’s Log, Lighthouse Digest and other publications. Now Tom has added still another volume to his list of publications – From Braziers And Bougies To Xenon. This is the story of lighthouse illumination through the centuries. Lighthouse illumination began with simple wood fires and progressed through a generation of other methods. Even the oil lamp began in simplicity and evolved into a machine with multiple wicks, clockwork oil pumps, specialized chimneys, hydraulic, pneumatic, and other variants. This detailed work takes you through the history of illumination methods from ‘braziers and bougies [candles] to xenon’, from the 1600’s up to the present day. Filled with photographs and diagrams, this is the definitive source on the subject. #23233. $26. Out of Stock. This detailed document lists and describes the builders and inventors who participated in some way in the development of lighthouses and their technical elements. Where possible, the author has included birth and death years to place his life in context with the timeline of developments. Also each entry is annotated with a footnote identifying the source of the data. Includes over 190 listings. 10p. Spiral bound. #22248. $26. Sale Price $18. This is the story of the life and work of Augustin Jean Fresnel. It is not the usual biography of his life, which you may have read before; instead it is the story of the very unusual school he attended, the mentor who made his work possible, and the lighthouse illumination equipment he designed. The work of these two ‘Genius and Mentor ’ produced the initial ideas that led to the magnificent design of the Fresnel lens for lighthouses that we are so familiar with. 16p. Spiral bound. #22246. $26. Sale Price $18. This long awaited document provides a chronology of the major technical events that have occurred in lighthouse development throughout time. From the earliest entry in 1300 bc when the Trojan built an early fire tower or lighthouse, to the decommissioning of the Nantucket lightship in 1985, this detailed listing is a must for the researcher, historian and writer as well as local enthusiasts. Includes well over 900 listings. 26p. Spiral bound. #22247. $26. Out of Stock. This is the story of lighthouse illumination methods used -in America from the 1700s to 1852. It includes many drawings and photographs of the early Winslow Lewis reflector light, the 9-inch Winslow Lewis lens, Spider Lamps, Bucket Lamps, etc. 20p. Spiral bound. #9440. $26. Out of Stock. This is the story of the development of optical quality glass in Europe and in America , the desire to build Fresnel lenses in America and the reasons that this desire was finally realized. It includes many previously unknown photographs of American-made Fresnel lenses. 18p. Spiral bound. #9441. $26. Sale Price $18. This is the story of David Porter Heap who was one of the Engineers to the Lighthouse Board and also served as the Engineer in the Third Lighthouse District for many years. 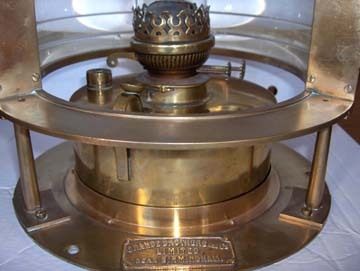 David Heap was responsible for improving many lighthouse-related items such as five and eight-day lamps, the Funck-Heap lamps, the first use of ball bearings in lens rotation, the first acetylene gas buoy in America, the Topophone and others. 13p. .Spiral bound. #9442. $26. Sale Price $18. This is the story of the development and use of kerosene as a fuel for lighthouse lamps. Henry Harrison Doty developed and patented lamps that were able to burn kerosene efficiently. His patents were purchased and used by the lighthouse authorities around the world with the exception of America where his patents resulted in years of litigation. It includes photographs and drawings of the early lamps used in burning kerosene. 10p. .Spiral bound. #9443. Sold Out. This is the story of the many kinds of fuel that were experimented with for use in lighthouses. Everything from Bude lamps and sheep's tails to atomic reactors is discussed. It includes a copy of the only known drawing of a Drummond Lime light as proposed for use in lighthouses. 12p. .Spiral bound. #9444. $26. Sale Price $18. This is the story of the glass used in lighthouse lenses. The story covers how the glass was made and how the lenses and prisms were made and polished. It includes drawings of the early glass polishing equipment. Also included is a chart defining all of the Fresnel lens orders from Hyper-radial through eight-order and a listing of the lens manufacturers. 11p. .Spiral bound. #9445. $26. Sale Price $18. This is the story of the Catoptric or mirror system of lighthouse illumination. One of the first methods employed in early lighthouses to concentrate the rays were flat, spherical and parabolic reflectors. Stevenson and later Winslow Lewis were noted for their early c.1800 reflector designs that were incorporated into early US lighthouses. This detailed work covers theirs and numerous other styles of reflectors in use as early as the 1770’s up to the 1950’s. Filled with 45 photographs and diagrams, this volume is the definitive source on the subject. 27p. Spiral bound. #21309. $26. Sale Price $18. Fresnel, M. A., Memoir Upon A New System Of Lighthouse Illumination. Paris . 1822. [reprint] 2001. Translated into English. English translation of Fresnel’s original memoir on his new system of lighthouse illumination from 1822, upon which modern lens apparatus was based. Memoir discusses in some detail the properties of large glass lenses and their use as replacements for parabolic reflectors that were in use at the time. In addition, lamps and burners to properly illuminate the apparatus are discussed, methods employed to produce a flash, and much more. A most interesting and important early work by this noted designer, now in English for us to study. 24p. Spiral bound. #2137. $26. Sale Price $18. Please see also our Fresnel Lens page. Page updated August 24, 2016 . All text and illustrations on web site Ó James W. Claflin . 08/24/2016 All rights reserved. Use prohibited without written permission.